Even crunches seem preferable to wearing this rig for 8-10 hours every day, no matter what the "Hidden Values". 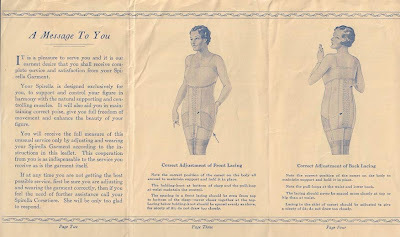 I love the brisk tone of the instructions, and the notion that the wearer and the girdle must work in cooperation to "enhance the beauty of the figure." The vow that there is ample room for the diaphragm only reinforces how restricted earlier generations must have been, no wonder they were such a bunch of swooners. Click on the photos to read more closely. Many thanks to seller Image Unearthed on Etsy. 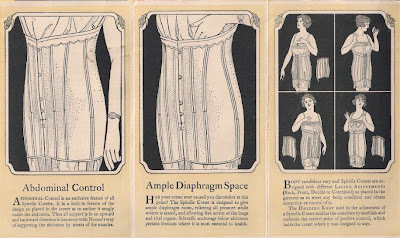 We are so lucky that we were born into the post corset era. But I do love seeing the office girls on Mad Men, who are fully girdled from bust to knees. Their figures look so tidy, even (and especially) Joan . . . I can only imagine the relief once the corset came off--a full body version of taking off the heels . . . Were the bones not removable? 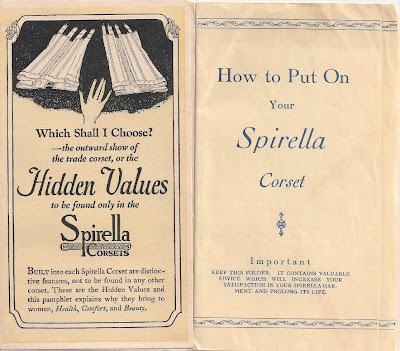 I know so little about vintage "intimate" apparel. Must get down to the V&A's underwear exhibit before it ends. Yes, the whale would have lent an interesting marine note to all the other smells in and around your person. I'd love to see a museum recreate THAT . . . thanks Susan! Whale bone, by this point was replaced with "feather boning" and/or steel boning. I have refferences as far back as the 1880's of using steel. And it was washable. There were even ads for "rust proof" steel boning in the early teens and 20's. Corsets, if made properly and not tight laced, are rather comfortable and add incredable support for you back.